“I have such faith in Seattle,” said Bono yesterday. In the city to discuss the AIDS emergency in Africa with staff from Seattle newspapers and the Bill & Melinda Gates Foundation, Bono described Seattle as a city with energy that could be harnessed to help Africa. While the Seattle Post-Intelligencer offered up a serious piece on Bono’s visit, the Seattle Times opted to share a beer with the U2 singer and focus on important topics such as Bono’s favorite superhero, Frank Sinatra tune, and junk food. No, no, no, I don’t believe this anymore! He’s in New York, Monaco and Seattle alsmost at the same time and the Concord is no longer flying! Now, i’m a flygirl and I travel the world at an amazing speed (in Barcelona last night, in Stockholm this morning and in Chicago next tuesday), but this is absurd. He must have had himself cloned! (Or have an amount of Frequent Flyer-miles that would take the population of India around the world eighty times). Didn’t Bono buy a plane? I though he could fly? One of his superpowers. lol Scott – i think you’re right! LOL@Scott..yup i believe he can fly too.. I am amazed at how Bono is getting around, too! I finally, finally got to meet him today in my neighborhood in Oakland, CAlifornia. this has been a dream of mine since I heard Boy. I wanted to tell him how much his creativity and his music mean to me – and finally got the chance. i gave him a flower and he gave me a big bear hug. I will remember it always. Wow! Is all I can say. I am so glad you got your chance to meet him! I hope to someday. I admire him and his music so much. I have been a fan for the last 16yrs and counting. 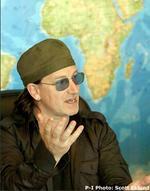 What I wouldn’t do for a bear hug from bono..You are so lucky! Thanks for sharing that with us. No, I don’t find Bono’s work to fight injustice boring at all. It is not only imperative on its own merits, but part of who he is, and who he is is one-fourth of some of the greatest music ever made. Creativity and personal growth don’t only happen in the studio. If Bono weren’t the kind of person who works toward things like this, his music wouldn’t be what it is. And if I were pressed to complain about time spent away from the other three, I would be moved to give my unsolicited opinion on his choice of social events — spending time with Naomi Campbell and Christy Turlington when he can be working with Edge, Adam and Larry? Talk about your warped priorities!!!! I hear ya paige! You said exactly what I have been trying to convey here but even better! Thank You! His activism is what is the essence of their music! Plus a lot more. Everyone be patient we will get that new album soon for god’s sake!